Although interpretations seem quirky, Spanish-inspired fare dominates at this popular Buckhead spot. : Gypsy Kitchen’s space is divided into three parts: bar area, dining room near the open kitchen, and a patio that's heated and usable in decent cool weather. 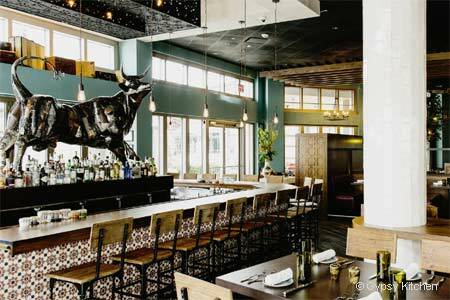 The restaurant aims to purvey Spanish-inspired fare. While the launch menu seemed close to authentic in at least some dishes, the current menu is much reduced in size and the interpretations have lost their connection with authenticity. For instance, the original chicken croquetas showed the creamy interior and crisp exterior expected if one has eaten them in Spain. Now, they are bready and exhibit little flavor. Similarly, the jamón Ibérico lacks complexity and depth of taste. The Moroccan aspect is reduced (a lamb tagine remains), but a chicken tikka masala has been added, somewhat out of context, we think. We do endorse the foie gras escabeche, which might well appear in any of the refined establishments near the Castellana; and the interpretation of flan, surrounded by toasted chopped hazelnuts. Fino sherry, served in a tulip-shaped glass but not cold enough, has been added to the wine list; other sherries are offered as well. Additionally, choose from Spanish wines (the Godello complements any seafood selections), but there's no rosé, which would pair well with much of the food.